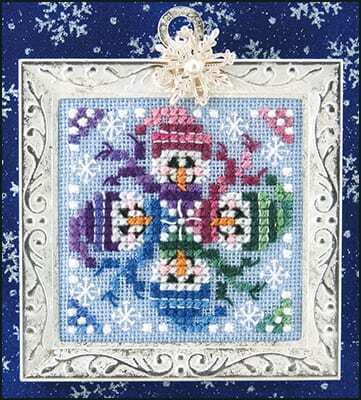 Four sweet snowmen faces in a circle make up this ornament design from Just Nan. Design size is 2″ x 2″ on 28 count linen – shown on Light Blue Milan from Graziano. It uses DMC floss colors plus Weeks Dye Works colors Bayberry, Ultraviolet, Blue Bonnet, and Love.